December | 2009 | Frank & Donnis Travel Blog "the more we see the more there is to see"
A little late I know but have a great festive season, a happy, safe n prosperous new year. Except not as prosperous as I would like my new year to be. Hope you had a good Christmas day and a few days of relaxation. Ours started off a bit differently and ended up, well, differently but enjoyable nonetheless. Donnis son Peter dropped in Christmas Eve on his way from Townsville to Brisbane. Donnis was at work so I made dinner. Donnis arrived home about 11pm and had a few minutes with Peter before going to bed. She had an early shift next morning and was gone by 6.30am and Peter left a few minutes later. He had a 13 hour drive ahead of him as he planned to catch up with his son Chris. That left me at home sweltering in the typical tropical Christmas heat and making family phone calls. Donnis was late arriving home so we took off in WHEREWILLWEGO about 6pm and headed for my daughter Melissa stud property at Finch Hatton. Arriving well past 8pm we had a Christmas dinner of cold meats and salads. It sure makes sense to have cold meals such as this or the more n more polular prawns n other seafoods instead of heating up the kitchen with a hot oven to produce hot chicken or turkey, pork and potatoes etc which nobody feels like eating anyway. We woke on Boxing Day to the sound of a horse cropping and birds singing. At Finch Hatton showing huge stables in background. Melissa had to leave for work shortly after breakfast while Steve had a two and a half hour drive to go to work at the mines so we headed off to Mackay to see what was happening with the Boxing Day sales. We had a wonderful lunch of leftover Turkey, potato salad and regular salad in the comfort of our MH parked in Bunnnings car park! Then it was off to Shoal Point to have a look at our house and how the gardens n lawn looks since we last saw it then we went to the beach, parked WWWGO near the water and had a luxurious afternoon espresso coffee n cream with fruit mince tarts, jelly, custard and ice cream. The cool sea breeeze was welcome. We felt a million $$$ with the view, the comfort of our own table and lounge chairs and the food. Then it was off to daughter Averyl house where we found her in a bit of pain with a headache and a tight neck muscle. They had spent the day at the Mackay Lagoons beside the water. Luckily we still had leftover Turkey on board so with a bit of cutting up and a salad, husband Paul found a McDonalds and bought some chips. That was our Boxing Day dinner. Next morning at 3am Paul left for work at the mines. After breakfast and a trip to Bunnings Averyl and the kids, Shelby-Rose and Anakin headed off to Mirani Weir for a day of waterskiing. Initially we had thought of joining them but decided instead to go to the movies. You know… for the air conditioning!!! As we approached the movie complex we saw so many cars headed there too and the car park already looked full so we drove past and went to Eimeo Beach instead. We parked at the beach and had a luxurious lunch of left over Turkey with gravy, pumpkin, cranberry sauce on toasted rye bread washed down with a cold beer. Ahh bliss! We were kept reasonably cool with a sea breeze coming off the uhhmm, well, errr … the sea. After lunch we drove to my sister Sandra house who was celebrating the first birthday of a granddaughter. John was working hard at the barbecue to feed about 20 people. After the party I was not feeling well. Lately I have been having some dizzy or light headed spells. They start off with a bit of a buzz in my head then I feel like toppling over. So I had a snooze beside the pool while Donnis joined a few of the guests in the pool. Once more we headed off to the movies and after buying our tickets to see Avatar in 3D we had dinner of fish n chips, salad and wine while parked on the grass between the movie theatre and a shopping centre. Donnis took all the left over champagne with grape juice in a soft drink bottle to the movies. By the way we enjoyed Avatar but be warned about 3D, it can play tricks with your eyes and mind. Sometimes you find yourself ducking out of the way from an object which really is not there! The surround sound system had animals stampeding from behind us. A complete audio and visual sensory experience. As we left the theatre, the line up to enter the 9.15pm session was already 4 wide and went all the way out the front door. Of course the carpark was full. Still. We left there and returned to Averyls house and plugged into 240volts so we could enjoy another night of air conditioned comfort. Monday we had a so so lunch at McDonalds – we would rather have a Turkey on toasted rye but we had used up both of those ingredients. Then it was a leisurely drive home. We stopped at Pindi Pindi and took a few photos – you may recall a few weeks ago I mentioned the Bougainvillia tree in bloom. Well here is the photo. This is a late entry but you may recall a post a few weeks back where I mention about a Tawny Frogmouth in a tree outside the office. Well it seems it is a nest and there is a fluffy chick which has made an appearance to the world. I took about 20 photos. It was kinda hard to find just one for this entry but here it is. 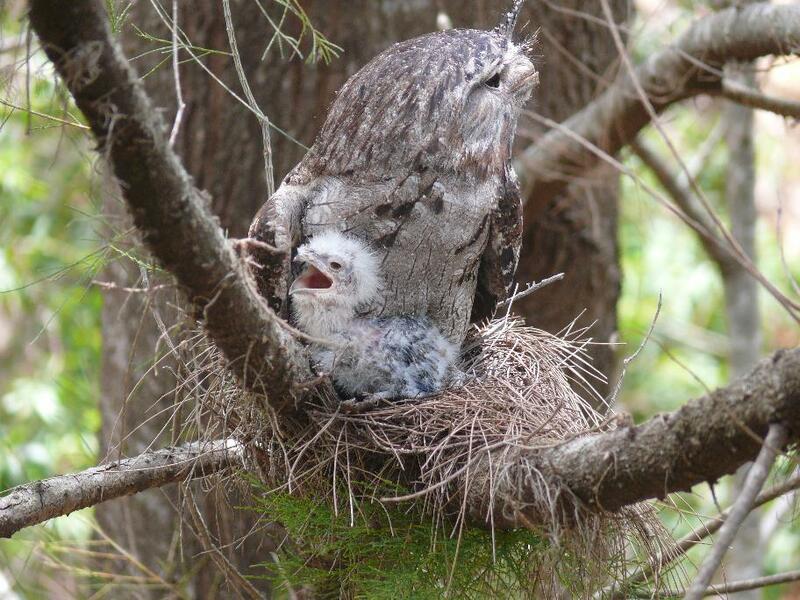 Tawny Frogmouth parent n chick. Today, Wednesday 30th December 2009. When I arrived at work I found the frogmouth chick had either been pushed or fell from the nest and was on the ground. However a 2nd adult frogmouth was watching over it. In fact it appeared to be nesting the chick under its chest. The 1st adult was still in the nest but there appeared to be a 2nd chick tucked in there and difficult to see. So now we had an adult and what appeared to be a chick in the nest and another adult and chick on the ground. For the three weeks or more we have been observing the nest we had never seen another adult but suspected there was one nearby. Later in the morning the ground adult left and the chick was struggling around on the ground. We were concerned as with all its movements it would bring attention to itself and be a target for dogs, cats, snakes and even other birds. I took some photos which although in focus look blurred. A Kookaburra was moving aroumd in the trees and keeping an eye on the chick. I suspect it is the same Kookaburra I saw late yesterday afternoon. When I next checked the chick was gone. Most likely the victim of foul play. Probably a late lunch for the Kookaburra. No further sign of the 2nd adult. Tomorrow might bring more changes. Perhaps the 2nd chick will venture out. 115. Sunday 20th December 2009…Reflections as we head to Christmas Day. Australia is a BIG COUNTRY. Much of it unchartered, untamed, untravelled and unseen. 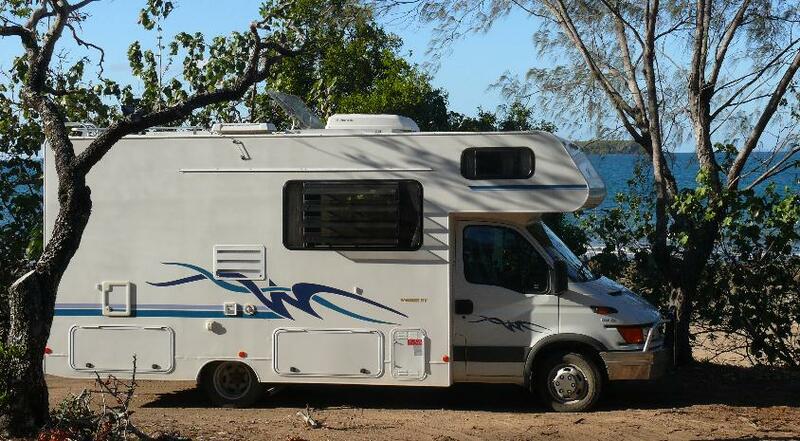 I have been reading a story about a group of people in 4WD motorhomes – 6 MH – who travelled across the Simpson Desert in 13 days. Of course they got into trouble and of course they got out of trouble because they had equipment, supplies, abilities and each other for help and support. They also carried lots of food and water and booze supplies as well as a couple of wives who enjoy baking in extreme conditions so every day they always had a bakehouse delight for morning tea. Who can whip up a chocolate cake and biscuits while parked on a desert track in the middle of nowhere in the time it takes for someone to say “smoko time”? Of course I am not planning such a trip, nevertheless I would enjoy a 4WD camping adventure to see some of those outback places. However our “WHEREWILLWEGO” is a big investment so we will be doing lots of travel in it but only to places where we can get to on a gazetted road. (Hold on for a minute while I go off on a tangent- Our MH which we now call “WHEREWILLWEGO” because 1, it needs a name and 2 I wanted some link to the name Winnebago. I thought I would share a couple of names an 87 y.o. mate, Vic, has used. Previously he had a campervan with a side door which when closed makes a Whizz Bang sound. In MH circles they are called “WHIZZBANGS” and not always in an affectionate way. The noise of a whizzbang at night is annoying to nearby campers especially if they are opened and closed regularly. Vic named his little camper “WIZZBAGO”. Earlier this year he sold the camper and bought a partially fitted out Nissan Civilian and with a lot of help from a friend now has a very comfortable MH. We all thought he could never come up with a name which included BAGO. At our meeting last weekend I noticed Vic is sporting a name on the front of his MH. It is now called “VICTORBAGO”. The wiley old coot is still pretty active “upstairs”! Reading the story I thought about our little trip earlier this year from Airlie Beach to Tasmania. We mostly stayed on bitumen roads and when we were on gravel roads they were mostly gazetted and regularly maintained. Only a little bit of travel was on “dirt tracks”. In fact it was the dirt tracks which revealed great locations which appealed to us. In all we usually made a shopping trip about every three days and topped up water and fuel as often. Imagine carrying enough food, water and fuel to get you across a desert in 13 days! Although we travelled over 7,500 klms in that 3 month trip, in reality we have only scratched the surface of places to see. Before we set off on the trip I did a lot of planning, especially getting to Tassie,. Getting home was loosely planned and as things turned out, totally changed. Roughly the distance from Airlie to Melbourne where we caught the car ferry is 3,000 klms, give or take a few k’s. Working on a theory of no more than 300 klms per day I reasoned we could do the trip in 10 days but as we had 15 days to do the travel I allowed for slow days or visiting days. As well I wanted to be near Brisbane as soon as possible because from there to Melbourne becomes more populated and travel days could be slower due to traffic. So… on day one we travelled 700 klms – without AC – and the second day was 600 klms which put us in Noosa. From here we could slow down a little and spend a bit of time visiting. We also had a couple of days to ourselves, If I did it again and did not have a time frame I think a month or six weeks for the 3,000 klm trip would be more appropriate. On arrival in Melbourne I felt a huge release that the major driving portion was over. At least for the time being. I knew we had to do the trip home again and in the back of my mind came the niggling thought I did not want to rush home. Comparing notes with a friend who has been full time on the road for three years I discovered a few facts when compared to our travels. Their shortest day of travel was 52 klms. The longest day was 320 klms. For us to travel to the nearest weekend camp involves a minimum of 75 klms each way. Thier average daily cost of fuel was $10. For the tree months our cost was $24 per day. This was because we were on the road at least every second day and travelling in Tassie involves lots of hills and mountain roads all winding and twisting. Plus the cost of fuel in NSW, Vic and Tassie are dearer than Qld – well at least it was then – Tassie being the dearest by far. 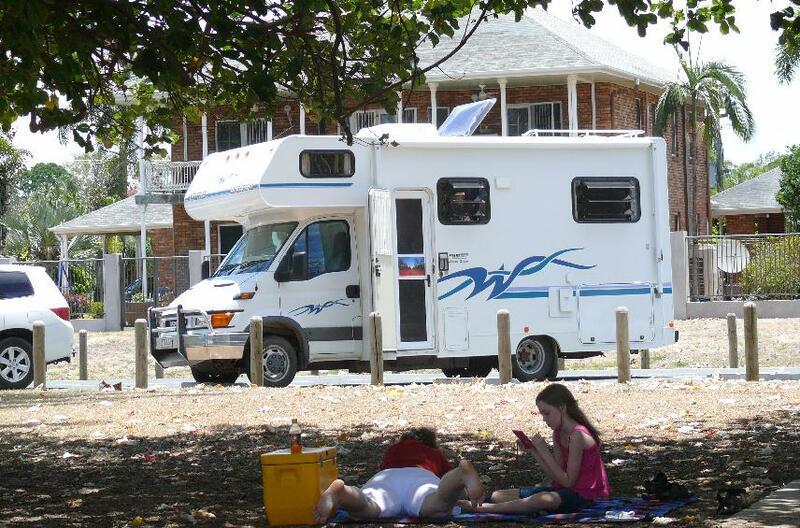 Their average daily cost of caravan park fees was $10. Our cost was $21 but I admit we stayed in caravan parks probably as much as 50% of the time. We also stayed in some National Parks which have big fees. We also included the cost of tours in this expenditure so overall this cost is not too bad. If I took out the tour costs, around $900, our daily average in CP will drop to $11!!! Although self sufficient we still had our share of eating out. After all we were on holiday and meant to enjoy ourselves. The cost of bought meals was $8 per day which included a pie here and there, crayfish sandwhiches, meals on board the ferry and so on. Not bad really. Most of the time we made our own meals. We also ate very well. I mentioned in my last post how a little community we have driven through hundreds of times holds interesting houses and history. We also discovered so many places to visit that at times we were tempted not to go to Tassie but instead to explore those side roads. We had already booked and paid for passage to Tassie so we kept to the game plan. We received a nice Christmas card and letter from Les B on Saddleback Mountain in NSW. We stayed with Les for one night as we travelled south. Les has been riding trials motorcycles for many years and rides the latest GasGas lightweight model. In his card he excitedly recounted the results of the NSW Trials Championships. Les finished 2nd in the Clubmans division while son Gary finished 2nd in the veterans and grandson Jarad was first in the 7 to 12 year olds. Christmas weather is here. It is hot hot hot and humid with a hint that rain is not far away. The sky is getting that wispy stormy strange cloud look which signals a storm is a coming. There is a severe storm alert for areas from Brisbane to Rockhampton where they can expect rain wind lightning thunder and hail. The sky is telling us something is heading our way but when and what we will have to wait and see. We can do with some rain. The grass which turned green and growing just a few weeks ago has withered, died and turned brown. In a way that is a blessing as my whippersnipper has died and will cost too much to repair. It needs replacing so next time I am in Bunnings I will have to look for a bargain. In the meantime bring on that rain. Navidad Alegre y un Año Nuevo Feliz, Seguro y Próspero. We were driving to Mackay on Saturday. We have driven this road hundredes of times. It is a trip of close to 2 hours. As we passed throught the community (yep, community, too small for a town or a village, there are only half a dozen scattered houses) of Pindi Pindi with traffic zipping past on their way North and traffic behind me wanting to pass, Donnis commented on the blooming Bougainvillia in the yard of one of the houses. The tree has actually attached itself to another tree and stands at least 12 metres tall and half a dozen metres wide. 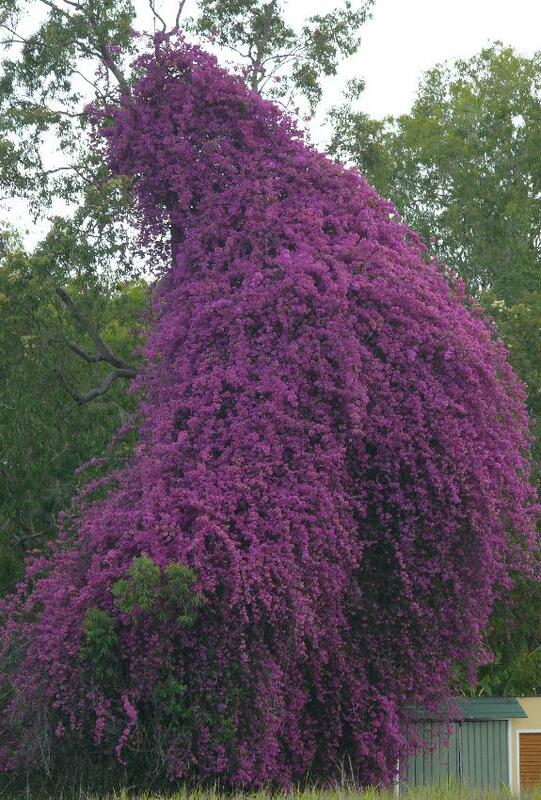 The mass of purple blooms is just stunning. We both commmented for maybe the hundredth time, “we should get a photo”. Yep we should. We should plan our trip so we can make a stop and take photos. Despite being a small community there is a bit of history here. There is a public primary school on the hill a few hundred metres from the highway. Local kids from surrounding farming communities go to school here. Closer to the highway is another house with a well maintained clay tennis court, the house with the bougainvillia, a house on the other side of the highway, an abandonned brickworks and mostly hidden from the highway by trees and bushes is a stately home including columns. The brickworks are heritage listed, having been built in 1933 and only ceasing operations in the last 20 years. Each of the houses appears quite substantial and not your average fibro cottage common around other communities. These houses are made of brick. The brickworks are in a state of near collapse but despite the heritage listing and suggestion of being an archeological site, the Qld Government Dept does nothing and the deterioration continues despite it being a risk of collapsing. and turned on our AC shortly after arriving and it stayed on until mid Sunday morning and turned on again mid afternoon. The Sugarloafers arranged a catered meal at a cost of $30 a head. I have no argument with the quantity of food nor the price. The quality and choice was lacking. Despite the food we had an enjoyable evening. I say evening instead of night because most members head back to their motorhomes by 8.30 to watch TV or bed. Donnis and I walked around the oval before retiring for the night. Sometime early in the evening two Army trucks arrived and their crew set up camp on the concrete floor of a pavillion. Sunday I was up a early for a walk and headed around the oval again. I caught up with the showgrounds caretaker who was walking his three Corgi’s. Now the caretaker is a grizzled old guy who looks a bit like an untidy, skinny, sunburned Santa Claus. He might also be an interesting person if he would only stop talking long enough so questions could be asked. So I listened. A few weeks ago he was wakened during the night and could see torchlight in the bar section. Now there has not been a bar operating since around June. It seems a couple of locals thought there must be booze and were trying to jemmy open the rolla door. The heroic caretaker armed himself with a cugel, walking stick and torch and headed off to investigate. The would be burglars saw his torch approaching and jumped into their 4WD and drove up the road heading for the caretaker who leapt out of their way at the last moment and rolled on the bitumen road getting a dose of gravel rash while the 4WD drove through the locked and padlocked main gates. The caretaker residence does not have a phone nor did he have a mobile having somehow run over it while mowing the oval the week before. He had to hop on to his pushbike and ride into town to summon the Police. At mid morning we had our usual monthly meeting followed by our AGM. Our President Sandra stood down as she has threatened to do the last two meetings. This time she meant it as her husband Phil is not well and although he was at the meeting he definately is not well. Several nominations were made including myself – nominated three times – declined three times. Finally somebody nominated Geoff, a new club member of six or so months. Geoff drives a large and impressive Sunliner. Geoff accepted the nomination was duly voted in and is now our new President. He lost no time reminding us that in order to have a club we must have people prepared to run it. Suitably chastened, those members such as myself and Nevin, Noel and even Chrystal a member only since the beginning of the year and with a very strong German accent , felt we were letting the side down. Whereas Sandra ran the club on a great social level and always put decisions to the assembled meeting, I feel Geoff is made of different material and is more inclined to follow rules and make decisions as required. Welcome Geoff and may you have a great and successful year. We stayed an extra night simply because we did not want to be rushing home on Sunday straight after the meeting. The whole idea of these weekends is to escape and relax. So we did. On our way home we saw a huge cruise liner had arrived in Airlie Beach. fines de semana viva largos. I know our readers are asking the question. Is the painting finished? Yes. Except for the stairs. We have to mix the colour ourselves but all going well we can probably fihish the stairs in a day. Including two coats. Oh, of course the downpipes only have a rough first coat but they can be finished when we do the stairs. Not quite a cause for celebration but I feel at least one job will no longer dominate my weekemds. Of course now summer is here the grass will grow and I will have to cut it every weekend. Later Donnis daughter Alecia called on Skype. She currently lives in Vancouver, BC, Canada. It is cold and wet. Sometimes it is wet and cold. Sometimes it is snowing and much colder. Today it was just cold. I mentioned our great weather and she commented “It is always perfect in Airlie Beach.” Although it is hot the temperatures rarely rise above 30 degrees although days can reach 35degrees it is more a rare day when that happens. A luxury cruise ship was anchoring off Airlie Beach. What a sight they are. Like a small city sitting on the ocean in plain view of the town. What a great photograph but alas I was painting and single minded in purpose and never took time away from the painting for a photo. The Airlie Beach carols By Candlelight was held on the Airlie Beach foreshore tonight. Donnis has been wanting to go all week. Although I was feeling a little below par I agreed that we would have an early dinner and attend. Let me digress here for a moment. For lunch we had a small tray of cooked and shelled prawns. For dinner I made a Thai Red Curry Banana Prawns dish. I had not been feeling 100% for most of the afternoon and I felt a headache coming on. My arms and legs and all my joints just felt “tired”. Anyway we arrive at the foreshore and it is packed with people. We finally find a place to put down our blanket and prepare for the Carols. We are near the playground and the swing needs oil and it makes a screeching noise on each swing. I put up with the noise although my headache was feeling worse and trying to sit on the blanket was murder on my back. In less than an hour Donnis proclaimed she was ready to go home (much to my relief) as there was too much background noise, the screeching of the swing was unpleasant and she disagreed with all the drinking at what should be a family event. As the night wore on my headache grew worse and the ache in my muscles and joints suggested I had a full blown attack of flu. Not so. Late in the evening I took a couple of pain killers and went to bed. Somewhere around half past midnight I was awakened by a terrible pain in my stomach and I stumbled off to the bathroom. Twenty minutes layer I crawled into bed feeling totally washed out. I drifted off into an uneasy sleep and an hour later was back up again. By morning, having been “up” most of the night, I was totally wasted with aches and pains all over and although I was shivering in bed Donnis checked my temperature. I was running a fever! No work today. I managed three jelly beans and a mouthful of orange juice about 9.30 am and somehow slept until 3.30pm when I was called off to the bathroom by my recalcitrant innards once more. Donnis started making a soup but the smell made me feel ill so it was back to the bedroom once more. I did manage a small bowl of soup at 5pm but the stomach was protesting. I still have the headache and wobbly legs and as I type this my concentration is poor. I have had to re-read and re-type this three times already. I guess one of the prawns I ate yesterday must have been “off”. No photos this week but I promise there will be photos next week as we are off to Sarina for the Sugarloafers Christmas party which will be catered again this year. el diahorrea por cualquier otro nombre sería como desagradable. We are still painting. It is now down to the fiddliest of the fiddly bits of the verandah trim. It is something that you cannot just take a broad brush or a roller and go. Being sure not to paint outside the line is time consuming and requires a steady hand, patience strong back for being in a crouched or stretched position for so long. I really hope to be able to report on the next entry that it is all finished. As you probably know if you have read this blog long enough, I sit on the verandah each morning to eat breakfast. The sun is just rising the birds are all twittering. Love it. Saturday the March Flies arrived. Now these nuisance creatures are known by a number of names including horse fly. A little entomological information follows. Biting flies are distributed throughout the world and, apart from nuisance biting, some are responsible for the transmission of diseases in humans and livestock in many countries. Although Australian biting flies (other than the mosquitoes) do not transmit diseases to humans they are renowned for painful bites and annoying habits during the summer months in general. Within Australia, the biting flies of greatest significance are the horse flies or March flies (Family Tabanidae), the stable flies (Family Muscidae) and the black flies (Family Simuliidae), as well as the biting midges or sand flies (Family Ceratopogonidae) and the mosquitoes (Family Culicidae), Compared with some other countries, black flies are usually not a concern in Australia although occasional problems occur following floods in northwestern NSW and Queensland. March Fly – not full size. It does make a loud buzzing noise as it flies around you. Often there are several. Sometimes if they land on you and you hit them they fall off, stunned, to the ground so make sure you finish them off. These nasties are solidly built. They are blood suckers. Their probiscis can penetrate socks and other clothing and once bitten you know about it. So if I sit outside for breakfast, their little blood radar can find me within 2 minutes and I am forced back inside. They will cling and fly with me as I walk so unless I do the arm flapping walk – difficult when you are carrying a cereal bowl with breakfast – they come inside with me. My idylic breakfast will be interrupted for a few weeks until they die out or go somewhere else.